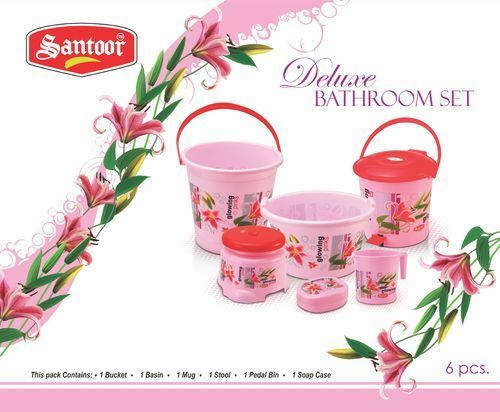 Bathroom Set Big Dlx is a set of bathroom products with foiling design. We Manufacturer and exporter of superior quality of Household Plastic Products and best Quality Household Products. Our product range includes Plastic Body Vacuum Flask, Insulated Vacuum Flasks, Soup Bowls, Cocktail Set, Plastic Bowl, Jaipuria Containers, Plastic Food Containers, Easy Lock Container, Dry Fruit Boxes, Plastic Water Cooler Jug, Thermo Jug, Water Jug, Cool Water Jug, Ganga Jal Water Jugs, Plastic Fridge Bottles, Printed Fridge Bottle, Sports Sipper Bottle, Ice World Water Bottles, Super Sipper Water Bottle, Insulated Lunch Box, Three Tier Tiffin Box, Thermal Insulated Lunch Box, Luxury Tiffin set, Picnic Tiffin Box etc. With a challenge to provide the best form of all types of plastic products, our unit is completely endured to work. These products are efficiently catered to different domestic fields like – household materials, daily uses. All our products are distinguished for their specific features and are manufactured under the supervision of experts. We take Bulk Orders for all the products.